Derma E Anti-Aging Hande Creme Moisturizer with Green Trea, Olive, Aloe, Vitamin E and MSM. Maintains youthful hands and cuticles. This unique non-greasy hand creme helps reverse the visible signs of aging, relive dry skin and support the health of your nails and cuticles. Formulated with antioxidants and botanicals including Green Tea, Olive, Aloe, and Cucumber as well as the remarkable sulfur containing compound MSM. 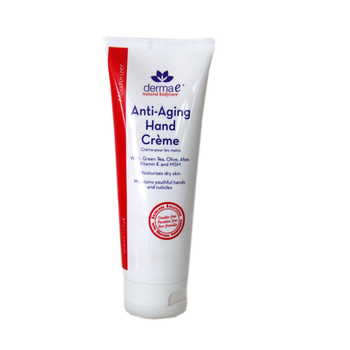 This dry skin moisturizer will help protect your hands and leave them softer, smoother and younger looking. 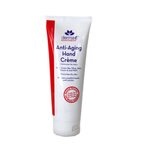 Apply anti-aging hand creme to your hands, including nails and cuticles. Massage in thoroughly. Apply whenever the skin is dry and thirsty. Water aqua, allantoin, glycerin, ethylthexyl pamitate, caprylic/capric triglyceride, cetyl alcohol, dimethicone, tocopheryl acetate vitamin E, organic aloe barbadensis leaf extract, olea europaea olive fruit oil, cucumis sativus cucumber fruit extract, organic camellia sinensis green tea leaf extract, polysorbate, stearyl alcohol, cetearyl alcohol, glyceryl stearate, glyceryl stearate SE, cetearyl glucoside, carbomer, panthenol, methyl sulfonyl methane, phenoxyethanol, ethylthexylglycerin, natural and fragrant oils.